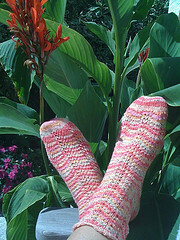 They are the perfect summer socks… soft and breathy and I just love the color. I used my favorite Schoeller+Stahl Fortissima Mexiko Cotton Stretch yarn. (It’s the very best sock yarn there is… hard wearing, pretty, stretchy and it keeps the shape perfectly.) The pattern is a simple feather and fan stitch and I absolutely love the way it turned out.